Remarkable sailing craft are the hallmark of the 34th America’s Cup but it’s not just the futuristic wing-sail AC72s turning heads in San Francisco – a traditional Māori waka (canoe) from New Zealand also has a lead role in the event. For three months, the eye-catching Waka Māori has been relocated to the Embarcadero waterfront just below San Francisco’s busy Oakland Bridge, which is crossed by about 300,000 people a day. 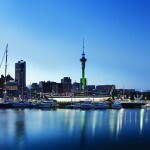 The striking venue showcases New Zealand business and tourism events organised by Emirates Team New Zealand (ETNZ), Auckland Tourism, Events and Economic Development (ATEED) and New Zealand Trade and Enterprise (NZTE). The high profile America’s Cup event is a wonderful opportunity for New Zealand companies to showcase their expertise on the international stage and a full business events programme has been developed alongside the sailing event. What better place to do it than inside Structurflex’s own, award-winning example of fabric architecture at its best? TVNZ Breakfast News featuring Team New Zealand’s Waka Māori Hospitality venue in San Francisco. 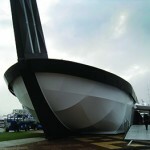 Our subsidiary company Covertex also features in this video, as one of Emirates Team New Zealand’s Official Sponsors. 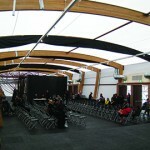 Ngāti Whātua Ōrākei and Structurflex Limited won the 2012 Industrial Fabrics Association International award of excellence for the design of Waka Māori.